The world’s second largest mining company has changed the man at the top. Roger Agnelli, who led the company for almost 10 years, was replaced by Murilo Ferreira last month. Though Agnelli grew the company into a global force in the industry, he did not manage to please the Brazilian government sufficiently. As a result the new president, Dilma Rousseff, pushed for a change. What is on top of the “To Do”-list for the new CEO? An analysis of Vale’s latest annual and financial reports, the press conference to introduce the new CEO, investor presentations, and the news about the company in the latest months yields a list of 10 issues that are likely to be at the top of Ferreira’s list of priorities. The list holds strategic, operational, financial and relational activities, each of which are scored in terms of importance and urgency. Priority 1 on the list is to build strong government relationships; priority 10 is to expand the metallurgical coal business in Latin America. Read on for the full list of priorities. For those readers working with Vale: don’t hesitate to forward the list to mr. Ferreira. Mr. Agnelli grew the company, but he did not manage to please the Brazilian government. The government controls the majority of the voting shares, and hopes to use Vale as a means to stimulate the domestic economy. The key task for mr. Ferreira will be to build strong government relationships without giving in to government requests which would hurt general shareholder value. A first step for each CEO after taking office is to get the key messages to be repeated over and over again to investors and employees. Especially Vale’s communication to the investor world has historically been poor. Selecting the key points to tell to the world the coming year(s) and tuning the communication and communication support is an important task during these first months. Related to the first point of building government relationships: the government claims a total of $16.0bln tax over the period 1996 to 2008 plus some $4.7bln in royalties (CFEM). Furthermore, Vale’s current effective tax rate is some 10% below official tax rate because of various tax incentives, for which the continuation is not sure. Reaching agreement with the authorities about these claims and the future tax incentives is crucial for the share price to increase. One of the key points mentioned in mr. Ferreira’s first press conference as CEO was the change of the company style towards a more decentralized system in which team work is incentivized more. Next to driving execution mr. Ferreira will need to be the living example of a global cultural change, in which each part of the business feels equally valuable. The next (potential) issue with the Brazilian government is Vale’s role in the Brazilian steelmaking industry. The government wants to create a strong vertically integrated player, and therefore needs Vale to cooperate with players like Gerdau and Usiminas. 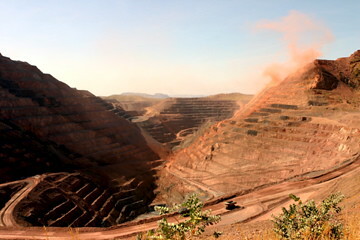 Although it is in Vale’s best interest to stimulate domestic demand for iron ore to offset the disadvantage in transportation costs to supply the Asian market versus Australian mines, the company wants to stay a pure miner. Developing and discussing strategic options for the domestic industry will be an important task for mr. Ferreira to demonstrate his leadership. Vale plans to invest $17.5bln in new project development this year, but various projects run the risk of delay. Most roadblocks have to do with demands by federal and regional governments (e.g. the temporary suspension of the Rio Colorado project in Argentina), signalling the requirement to more proactively involve governments in planning procedures. A key competitive advantage to Vale is the low cost base of its operations in Brazil. The risk of lower iron ore prices forces mr. Ferreira to try to keep costs down at a time of cost inflation. Especially the management of the energy matrix (energy costs account for over 15% of COGS) and of outsourced services, which are sensitive to Brazilian wage inflation, will require management attention. A key task for any big mining firm this decade is to fight for pole position in supplying the number one growth market: China. Mr. Agnelli secured various lucrative supply deals, but Vale did not yet sign significant partnerships. Mr. Ferreira has limited experience with the Chinese market and will thus need to spend time on getting to know the key players and developing relationships which are important for both future development and future supply contracts. Vale still is a very much Brazilian company: out of the 120 thousand workers (incl. 40% contractors) 80% is located in Brazil. However, this Brazilian focus is starting to hinder the company in attracting international investors, customers, and employees. Even press conference in which new CEO was presented was conducted in Portuguese, certainly posing an obstacle to some investors. Appointing CEO with experience of working in North America is step in the right direction, but mr. Ferreira will need to do more to improve the international image of his company. Partly driven by the need to diversify the company’s revenue base (68% of revenue still comes from iron ore & pellets, with an even higher percentage when looking at profits), partly driven by the need to build the domestic steel industry, Vale needs to gain access to metallurgical coal close to home. The company operates thermal coal mines in Brazil, but metallurgical coals needs to be imported. Exploration in Colombia is promising, but more needs to be done to build the coal business.